Each ADI engineer is a fully qualified plumber and is also a Gas Safe (previously known as Corgi) registered gas engineer. This means that you can call us knowing that you’ll be dealing with registered, reliable leak detection professionals who have the credentials to prove it. After we’ve found the source of your leak you then have the choice of either requesting that our qualified and skilled engineers to fix it for you or alternatively you can engage the services of your own plumber if you wish; we’re happy with whatever decision you make. 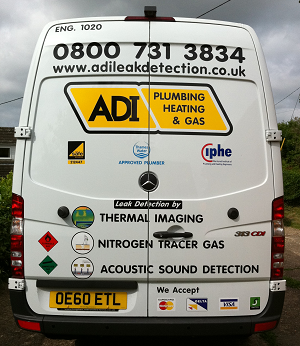 ADI can cater for all your leak detection requirements and any one of our highly trained engineers can assist you with any plumbing or heating issue you may be experiencing right now. ADI gas and water leak detection and repair services are available to both home and business customers as well as clients in the domestic, commercial, insurance and housing association sectors also – we’re happy to work on any projects you task us with. So why not have a browse around our site to learn more about how can help you. Or if you fancy a quick chat with one of our friendly, qualified and helpful engineers why not call us now on our Freephone number 0800 731 3843? All of the work carried out by our engineers is fully guaranteed, priced very competitively for our extremely high standard of work and we’re also happy to work on jobs of any size – nothing is too big or small for us to handle. 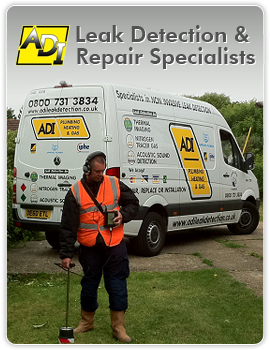 ADI are the only choice if you want to hire a professional and reliable leak detection company in the London area. Call 0800 731 3843 When You Need Gas Or Water Leak Detection In London Or The South East – We Are Here To Serve You.